Berlin is a vibrant, multicultural and unpretentious modern capital city. It still shows glimpses of its dark, turbulent history and possesses an incomprehensible affinity for the music of David Hasselhoff. The flight time to Berlin from London is under 2 hours so makes it an ideal destination for a city break at any time of the year. 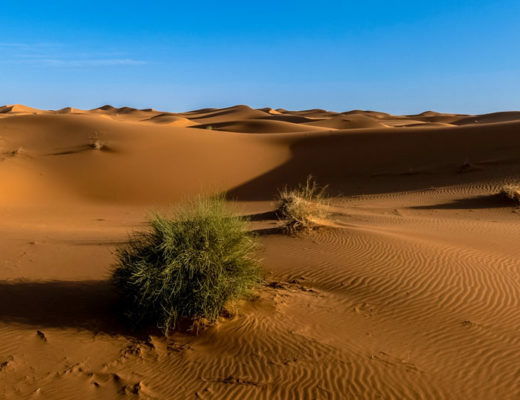 We went in Winter, which is the best time for cheap flights and accommodation, although Berlin is one of the cheapest capital cities in Western Europe. We were lucky with the weather, it was cold and we did have snow but it wasn’t too cold and the snow wasn’t disruptive. However at the time of writing the current daytime high is -1°c and the low is -7°c. The usual selection of low cost airlines fly to Berlin but it may be worth checking British Airways. To our surprise their flight and hotel package was as cheap as the budget airlines. Also the price included checked bags up to 23kg. (We paid for the full trip ourselves and were not funded in any way, well apart from the Christmas money my mother gave us!). Berlin is large and spread out and does not really have a centre, basically due to it’s divided past. However getting around is straight forward, there is an efficient and more importantly, easy to use public transport system. The ticket machines at the stations have an English language option. To find out more about getting around and to check the current fares visit Public Transport in Berlin. Berlin is a photographers dream, so have your camera at the ready and before you go check out the best places to take photos in Berlin to save time. 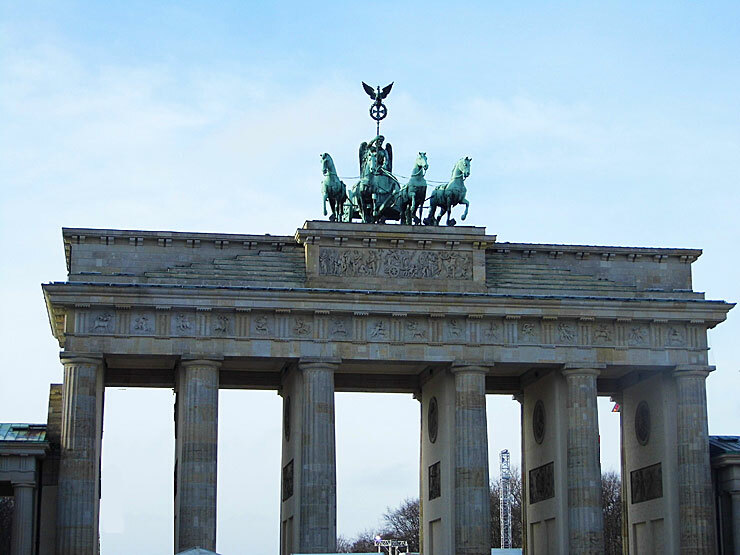 The Brandenburg Gate is the iconic Berlin landmark. It was the symbol of division between East and West Berlin but has now become the symbol of German unity. The gate was first opened in 1791 and has survived Berlin’s tempestuous history despite being heavily damaged during the Second World War. 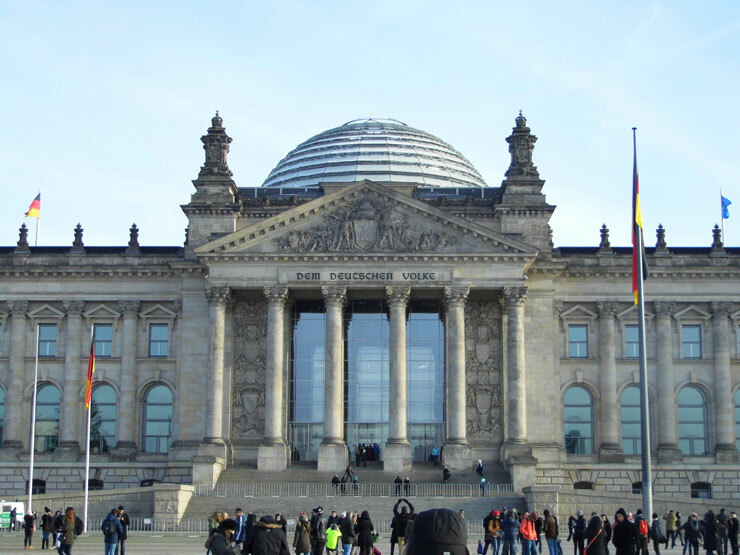 The Reichstag was first completed in 1894, ‘mysteriously’ burnt in 1933, blown up in 1945, rebuilt in the sixties and finally redesigned by Norman Foster with the addition of the famous glass dome in the nineties. To visit the dome you need to book online in advance (free) and you will need photo ID when you arrive. The memorial retains a 200 foot long section of the wall as it was when the wall fell. Go to the visitors centre first next to the Nordbahnhof S-Bahn station. The centre gives you an overview of the memorial and explains what there is to see and do. Allow a couple of hours to really look around, definitely a Berlin ‘must see‘. 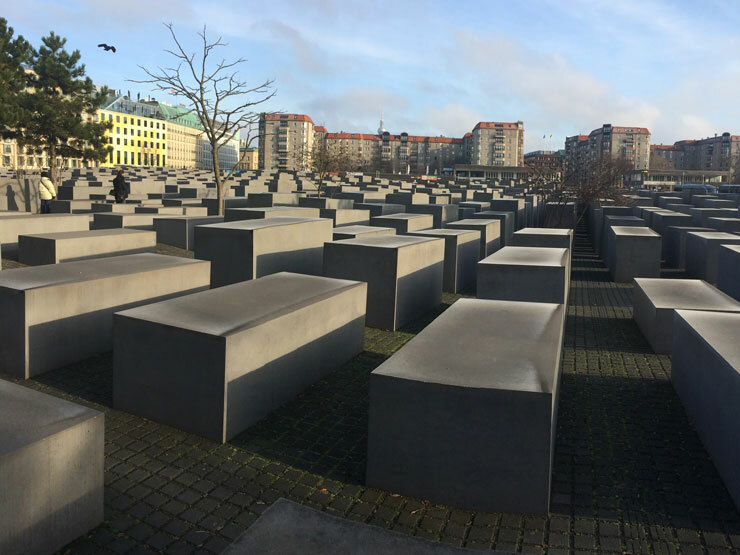 The Memorial to the Murdered Jews of Europe also referred to as the Holocaust Memorial is a sobering concrete block design by Peter Eisenman. Walk through the narrow gaps between the blocks which are designed to give ‘an uneasy, confusing atmosphere‘ and the whole sculpture aims to represent ‘the ordered system that had lost touch with human reason‘. 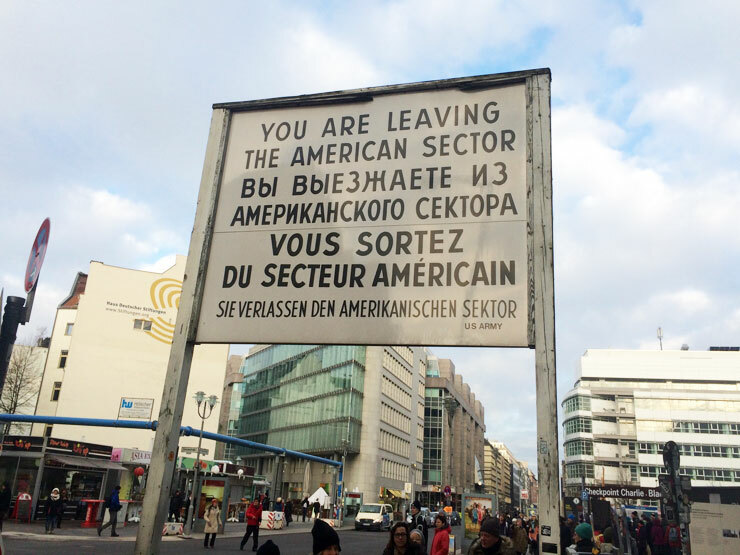 From 1961 to 1990 Checkpoint Charlie was the main entry and departure point for non-German visitors entering East Berlin. Also in 1961 it was the place where US and Soviet tanks went head to head in a demonstration of cold war brinkmanship. There is a replica of the guard house with ‘soldiers’ but avoid these as they are simply demanding money for photographs. A bit of a shame as other areas commemorating Berlin’s dark past are a bit more poignant and respectful. If you’re a fan of sausage, ketchup and curry powder then this is the dish for you. 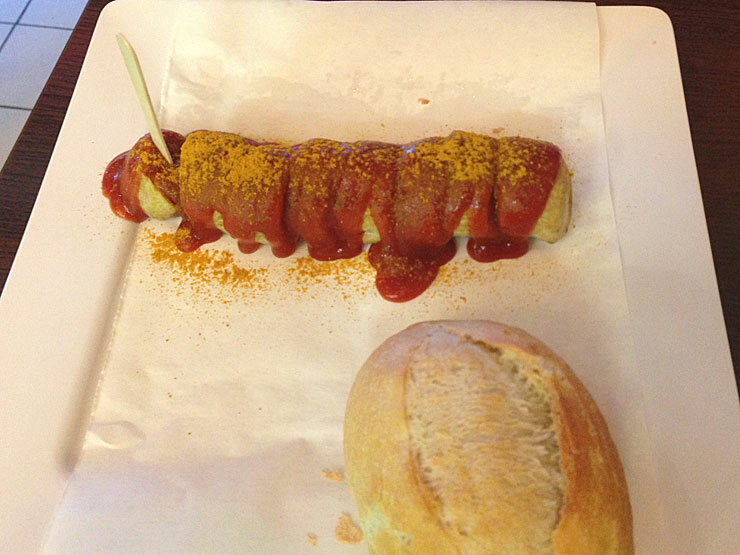 Before our visit we thought the currywurst was something involving a rich curry sauce and sausage but it is just a sausage covered with ketchup and sprinkled with curry powder. Belin has been bombed, divided and finally reunited, it has now become one of the most intriguing and exciting cities in Europe. Follow in the footsteps of Einstein, JFK and David Bowie and get inspired by this fascinating destination. Have you been to Berlin recently or do you live there, what are your tips for our next visit? It’s interesting to learn Berlin is one of the more affordable cities in western Europe, especially with the recent devaluation in our currency travel has become more expensive again. The historic aspects are fascinating and the architecture aspect are a big draw for me. The increased prices haven’t really kicked in as most airlines hedged their fuel costs, but these will definitely increase in 2017. The value of the pound is very weak against all currencies (thanks Brexit) but Berlin hotels and food is still very reasonable, a fraction of the cost of London and Paris. Long live the Hoff! I LOVED Berlin when we visited. All the monuments, the history with German beer and currywurst to top it off. Which suburb did you stay in, out of curiosity? We stayed in former west in Kurfürstendamm near the main shopping area. We didn’t really know where to stay as it was our first visit but there was a really good hotel deal. There was also a really good food hall nearby on the top floor of KaDeWe. There are a number of memorials around the city but the main Holocaust Memorial acts as a centre with a good information centre. The only thing I found odd was the number of people taking ‘selfies’ and ‘selfie sticks’ , we thought it inappropriate. We loved Berlin. We went in winter so it was quite cold which meant eating more currywurst than we probably needed, and getting warm in bars where we could imbibe great german beers. 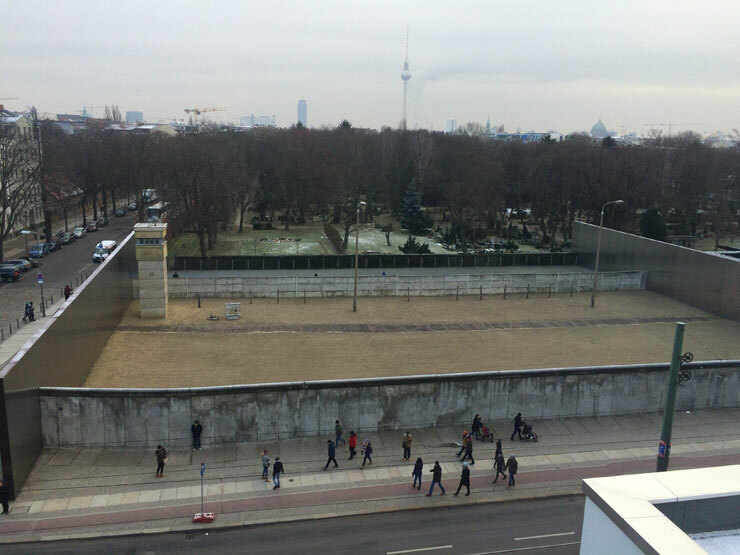 Loved the history of Berlin, especially since my husband was there when the wall was coming down. The Reichstag is just an incredible building, along with all of it’s other major icons. It can get really cold in winter, we were lucky as it wasn’t too bad. It is a quieter time also. We loved our visit to Berlin and did all the things you mention but unfortunately I really wasn’t a fan of the currywurst! We really enjoyed the the holocaust memorial tho and found it particularly moving and informative. I can understand how the currywurst isn’t to everyones taste. It’s not really a gastronomic masterpiece. I actually loveee currywurst! But I tasted the Dutch and Belgian kind — though I don’t think there’s really much differnece, no? I especially love it with lots of white onions and ketchup and mayonnaise 😀 Anyhow, Berlin is a absolutely amazing city! Yes there is a lot to see, more than we could do on our break so we will definitely go back soon. After Barcelona (my city 😉 ) Berlin is my most favorite city in Europe. 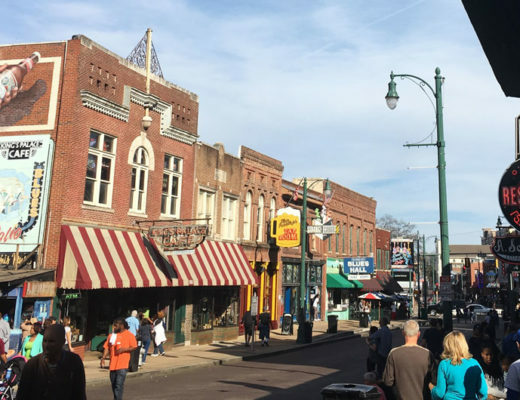 The city is an open-air museum and I just love its young atmosphere and social life. Plus it’s f*** cheap! I also love the currywurst! It’s something which you can’t find in my country! The best snack ever! We were lucky enough to visit Barcelona and Berlin last year. Both great cities and very different. 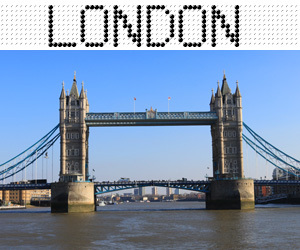 A truly iconic city. I love the vibe, the food and the people! You’ve pointed out so many great things to do. I love the historic places, and the currywurst of course! 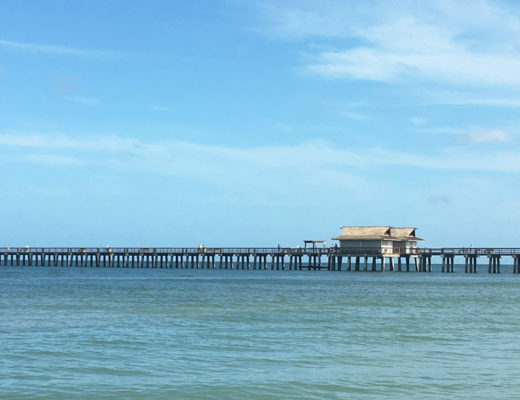 Yes the vibe is great and there are some many famous historic places to visit. 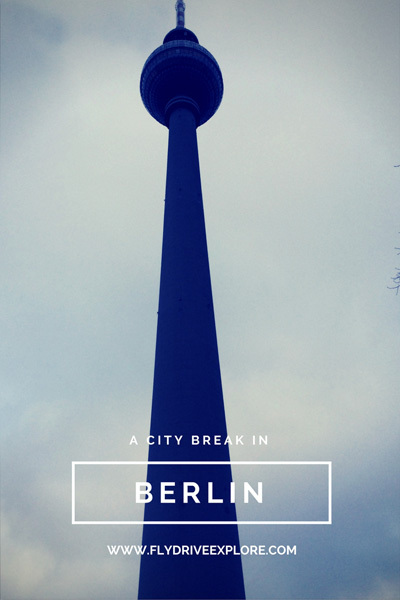 I loved my visit to Berlin, though I went through as part of a Contiki tour in my early twenties, so I would love to get back and enjoy the city in a State which is more sober!!! I can say that I thoroughly enjoyed the bar scene though! I do vividly remember my visit to the Holocaust Memorial … such a somber moment which really captured the feeling of unbalance and unease. So much history in Berlin and so much to see. It has probably changed a lot since your last visit but the same vibrant heart remains. To us, Berlin feels different to the rest of Germany, it’s a unique place.